It has a been a week of ups and downs this week especially in English as the class have been writing their independent explanation text on: How to look after a dog, for beginners. This was followed by Mr Hays giving them all a SPaG test to really see how much they have learned throughout the year! It is safe to say, now that they've been marked, that they have retained so much information! In Maths we have been looking into the relationships of factor pairs and weedling out the numbers that only have themselves and 1 as a factor... I wonder if any of my class know the name of this kind of number? During topic lessons we have discovered the delightfully cruel nature of King John in the middle ages. The children were amazed at how utterly selfish and single-minded he was. But they were equally amazed that the Magna Carta that he signed still has some uses for our society to this day! But the highlight of the week was in their music - Brazilian Fever was much in evidence. 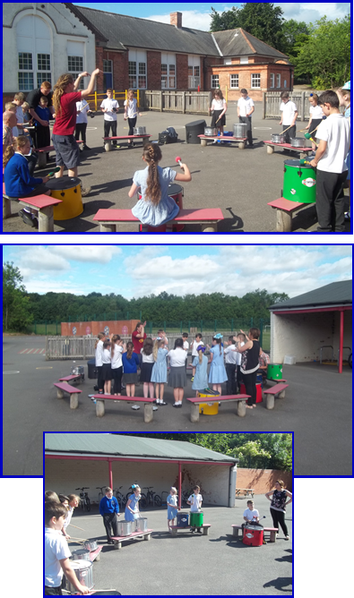 Year 4 were given the opportunity to learn Brazilian Drumming - and boy did they enjoy it! Some of our children will be performing at the Canch on Saturday morning at 10:00am, in association with the KURB (Kindness and Understanding Beats Racism and Bullying) project. Other schools will be taking part and performing, too. Please go along and show your support, if you can. I can certainly recommend the performance!